Prairie River Junior High School student Waylon Lauck received a special welding package from Northern Lakes College and the Canadian Welding Association on Oct. 27. Left-right, are CWA Western Canada manager Ken McKen, Canadian Welding Association Foundation junior technical director Cody Vigeant, Waylon Lauck, NLC college president and CEO Ann Everatt, and Brian Panasiuk, chair of dual credit and recruitment for NLC. 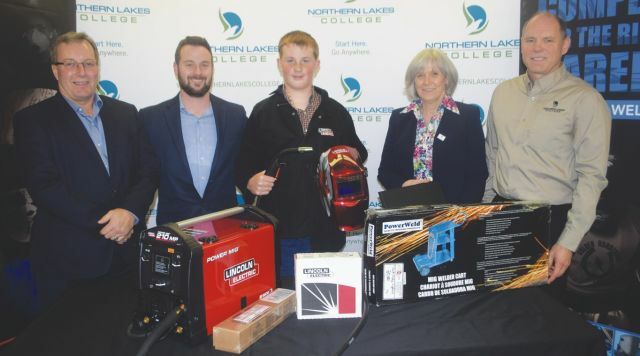 A young High Prairie teen has been recognized by Northern Lakes College for his ambition to pursue a career in welding. Waylon Lauck was honoured on Oct. 27 by the college and the Canadian Welding Association Foundation and presented with special tools to prepare him for his chosen trade. “I’m just overwhelmed with the training and equipment to fulfil my welding career,” says Lauck, 13, son of David and Karen Lauck. He was presented a package of welding equipment from the welding foundation and a certificate of tuition for one year from the college. “We’ve got everything you need to start creating sparks,” says Cody Vigeant, Canadian Welding Association Foundation junior technical director. Lauck showed strong promise as a student at a weeklong Mind Over Metal Camp in July in High Prairie for youth ages 12-15, sponsored by the college and the association. He had already started to collect recyclable bottles to raise money for equipment before he received the gifts. “Last summer, I decided to pursue a career in welding,” says Lauck, a Grade 8 student at Prairie River Junior High School in High Prairie. His mother appreciated the support for her son. “It has opened up his future forever,” Karen Lauck says. Presenters acknowledged the commitment and determination of young student. “We need to get our youth engaged,” says Ann Everatt, president and CEO of NLC. She adds that Waylon will likely take his training in the new High Prairie college campus when he takes dual credits as a high school student. Special words were addressed to Lauck from Vigeant. “It’s great to see young guys like Waylon who have an interest and passion,” Vigeant says. Vigeant says Lauck was one particular student at the camp who showed passion and promise, and led to the gifts. He also acknowledged the support from trades schools such as NLC.